Photos are for editorial use only in conjunction with the direct publicity or promotion of this program, for a period of three years from the program's original program offer date, unless otherwise noted. No other rights are granted. All rights reserved. -- All images are .jpgs unless indicated. 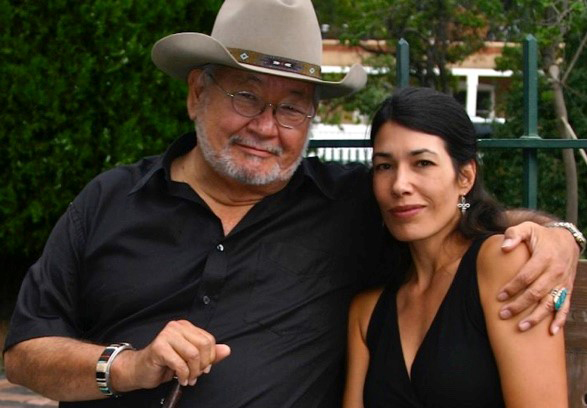 N. Scott Momaday, recipient of the first Pulitzer Prize for Fiction awarded to a Native American writer, and his daughter, filmmaker Jill Momaday Gray, take viewers on a modern-day road trip loosely based on his Kiowa nation’s ancestral myths and legends, from his bestselling book, "The Way to Rainy Mountain." 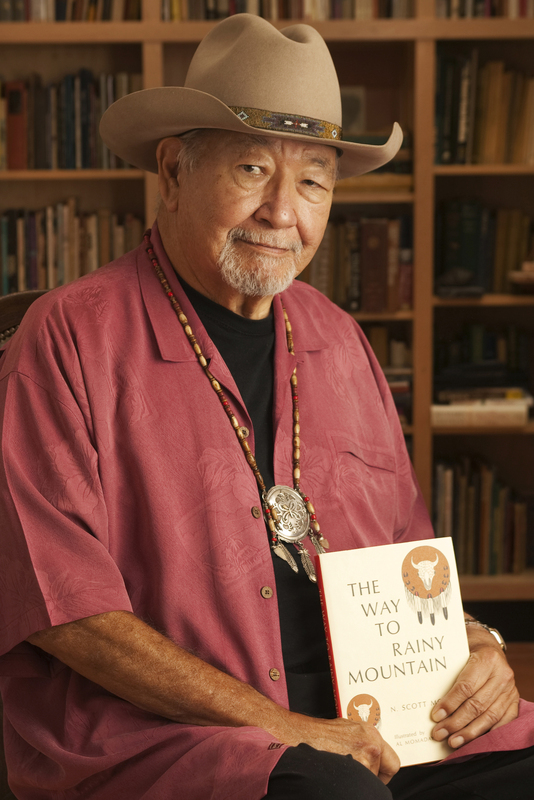 Return to Rainy Mountain is a one-hour documentary celebrating “Living Legend,” author N. Scott Momaday. It’s loosely based on his Kiowa nation’s ancestral myths and legends conveyed in his bestselling book, The Way to Rainy Mountain (UNM Press, 1969). His legacy includes winning the only Pulitzer Prize for Literature awarded to a Native American writer, for his 1969 novel, House Made of Dawn. Momaday earned a Masters and a PhD in English from Stanford University and has 20 honorary doctorates from esteemed universities. He was featured in the 2005 award-winning PBS documentary Remembered Earth: New Mexico’s High Desert and narrated the 1978 documentary More Than Bows and Arrow, which also aired on PBS and Discovery Channel. He was awarded the National Medal of Arts in 2007 by President Bush "for his writings and his work that celebrates and preserves Native American art and oral tradition." Among his other notable honors are the Oklahoma Centennial State Poet Laureate in 2007, a Guggenheim Fellowship and UNESCO's Artist for Peace Award. 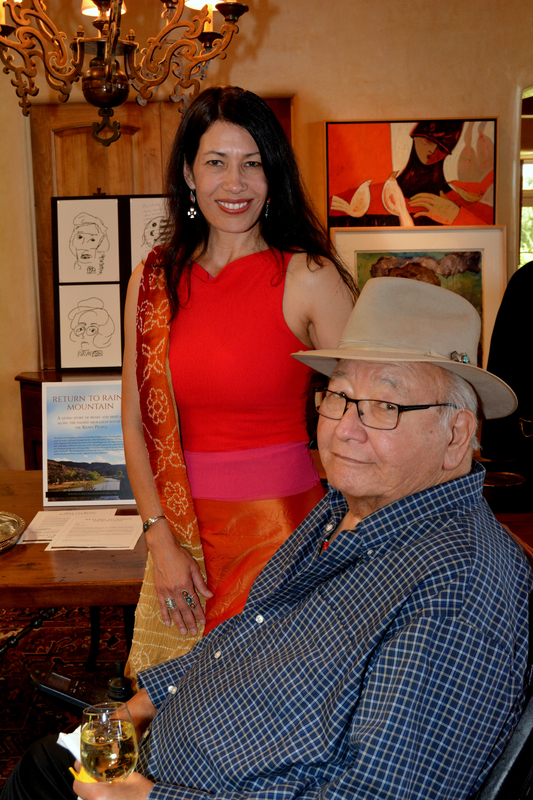 The film features Momaday and his filmmaker daughter, Director Jill Momaday Gray, as they take their viewers on a modern-day road trip. They retrace the Kiowa’s sacred journey to Devil’s Tower, Wyoming and Rainy Mountain in Southwestern Oklahoma, landmarks that inform the Kiowa myths, legends and oral traditions passed along for generations. As early as 1971, Momaday was recognized as a pioneer of environmental education, authoring "The American Land Ethic" which conveyed the tradition of respect for nature practiced by America’s native people. Director, Jill Momaday Gray steps into the role of a modern spokesperson for this tradition of respect. The 2015 annual honoree for New Mexico Women in the Arts says, “In addition to sharing the Kiowa history and oral tradition, the film gave me time with my father and a chance to really know him. He was absent much of my life as he carved out his brilliant career and legacy. We’ve been fitting the pieces of a puzzle together to tell one big story which is also the bigger story of Humanity: Man’s relationship to nature, animals, the universe, the Creator and each other.” The story follows two arcs of the cultural legends and their family reconciliation. Serving as a mentor to the film is Kirk Ellis, an Emmy award winning writer and producer for the 2008 HBO mini-series, John Adams. Ellis also received a Western Heritage Award and the two Humanitas Prizes. He was nominated for a Producers Guild of America Award for Into the West in 2005. Producing and creative partner, Lisa K. Condon, is an Entertainment Attorney with years of experience in Tribal Law and a history of representing the underdog. Previously an Environmental Attorney, Condon worked high profile cases in consultation with Cesar Chavez and on behalf of Tribal Councils. Her dedication lies in promoting tribal filmmakers and informative, culturally significant films. The visual/sound team includes Emmy and Peabody Award winning Cinematographers and Editors: Doug Crawford (Surviving Columbus: The Story of the Pueblo People, PBS, 120 mins., 1992) also Director of Photography for The Native Americans (TBS, 1994); and David Aubrey, nominated for the Best Edited Documentary (Baraka, 1993); plus Blackhorse Lowe, Native cinematographer (Among Ravens, 2014); Royce Sharp, Sound(This May Be The Last Time, 2014) Sheila Seclearr, a professional screenwriter and founder of Filmarado (show business strategies) acts as Co-Producer. Return to Rainy Mountain has a partnership with Vision Maker Media, a PBS presenter of American Indian projects. Vision Maker Media will supervise, distribute and broadcast through PBS and CPB to a potential audience of 122 million viewers in the U.S. The filmmakers anticipate broad International distribution due of the scope and breadth of N. Scott Momaday’s acclaimed global contribution. Pulitzer Prize winning Native American Author N. Scott Momaday take viewers on a modern-day road trip loosely based on the Kiowa nation’s ancestral myths, legends and collective identity in the documentary RETURN TO RAINY MOUNTAIN. RETURN TO RAINY MOUNTAIN retraces the sacred journey of the Kiowa people to Devil’s Tower in Wyoming, and Rainy Mountain in southwestern Oklahoma -- landmarks that inform the Kiowa oral traditions passed along for generations. Based on the bestselling book by Pulitzer Prize winning Native American Author N. Scott Momaday. Filmmaker Jill Momaday Gray celebrates the life of her father, Native American Author N. Scott Momaday, in RETURN TO RAINY MOUNTAIN. Major funding provided by: The Corporation for Public Broadcasting. Free upon notification of intent to carry. "It's really important to me that PBS is here for the next generation."